It’s easy to be overwhelmed by the size of your winter squash harvest. But not to worry. 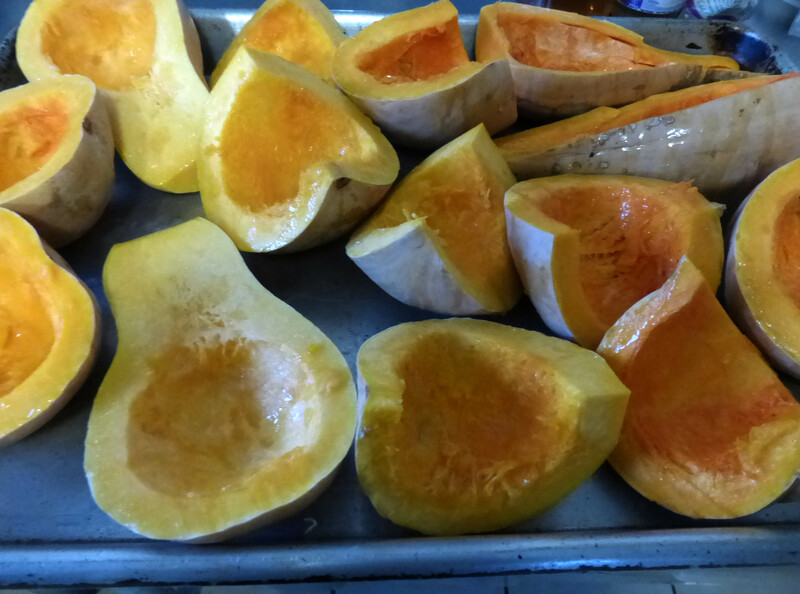 Winter squash will keep for months if undamaged, cured well, and stored well. If you have enough pumpkin recipes and squash recipes, you won’t get tired of it. Pumpkin butter is delicious, and it’s not hard to make two months’ worth at once. Start by cutting any kind of pumpkin or other winter squash in half or quarters. Scoop out the seeds, and for best texture, scrape out the stringy pulp around the seeds. Lay the squash on a baking sheet. Some prefer face up; others prefer face down. We cooked ours face up. You’ll retain the most moisture in your squash if you cook it face down, with a little water in the pan. 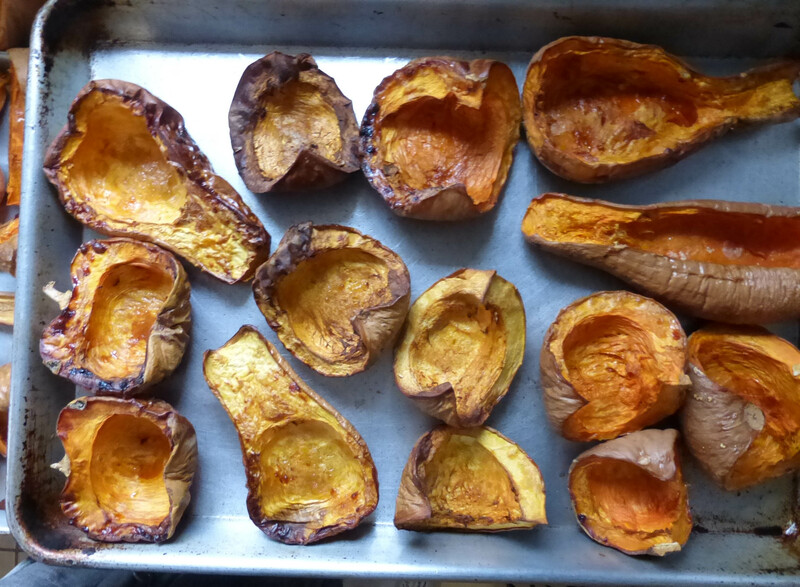 Bake the squash until it is easy to put a fork through it. We baked ours for a little over an hour. Large chunks of very large squash would take longer. When the baked squash is cool enough to handle, scrape it off the skin. 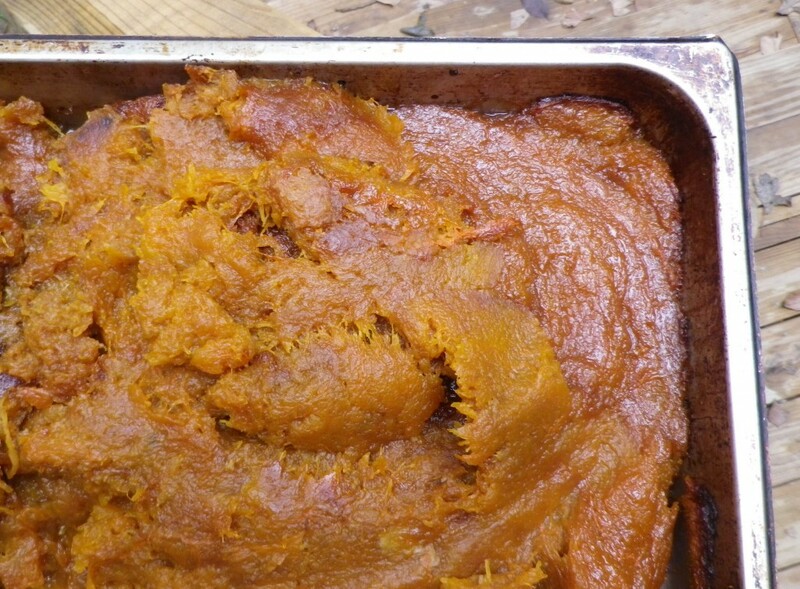 Even if the skin is tender and soft enough to be palatable with a chunk of squash, the texture of the pumpkin butter will be much better (and more buttery!) without it. Now it’s time to add spices and sugar. We used one part sugar for every four parts squash. We also added cinnamon, ginger, and cloves. Sorry, we didn’t measure the spices; we just tasted the spiced pumpkin and added a few more pinches of ginger. Some people add orange zest, but we didn’t. When you’ve mixed the spices into the squash, put it back in the oven. Ours made a layer about 2 inches deep in a steam table tray, and we baked it for about 45 minutes at 350 degrees the second time around. If you spread yours into a thinner layer, you’ll probably want to bake it for less time. I like pumpkin butter the most when some areas have just started to turn dark brown and caramelize. 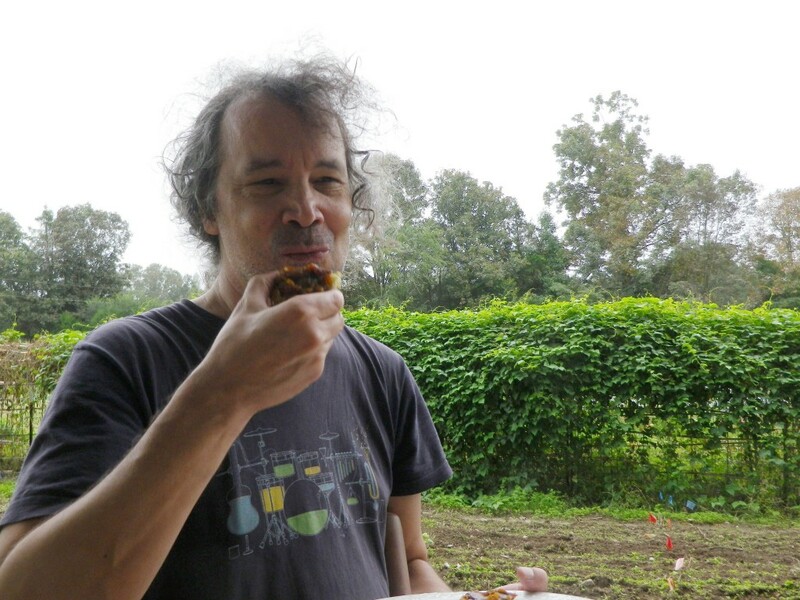 While Ken was planting spinach in the garden, I brought him a biscuit with a thick layer of fresh pumpkin butter. 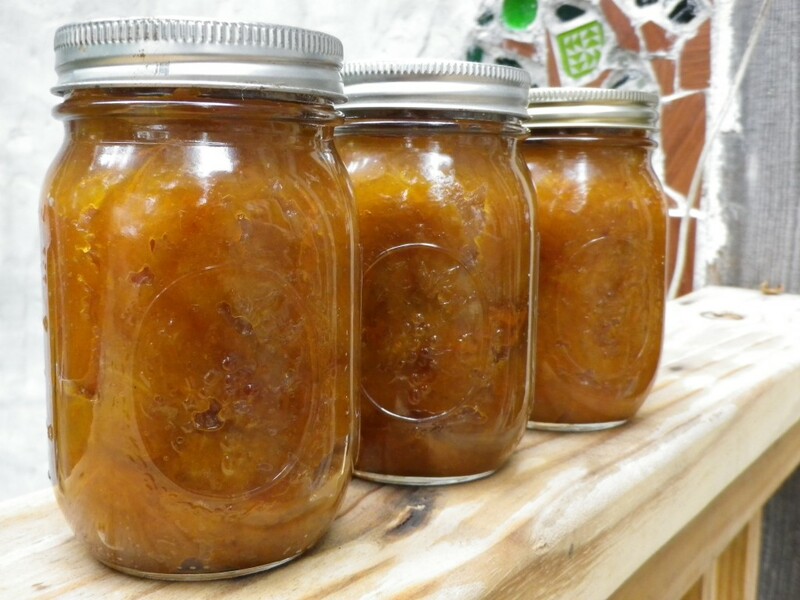 We like to put our pumpkin butter in mason jars, but we don’t can it. It’s not acidic enough to be canned in a boiling water bath, and pressure canning might ruin the texture. We’ll store these jars in the refrigerator for up to a couple of months. 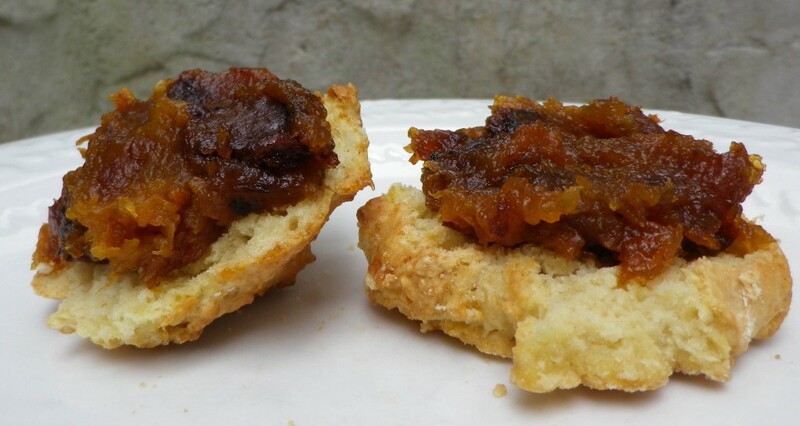 You might also want to try the pumpkin jam recipe that was recently featured in our e-newsletter.